The back room of Davis Square’s Irish pub, The Burren, appeared at first glance like a regular busy evening on Monday night, with a crowd of workers looking to relax. But this wasn’t your average crowd. 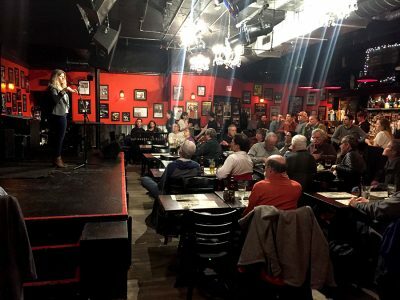 The room was filled with scientists, researchers and artificial intelligence enthusiasts, all eagerly awaiting a presentation by Kate Saenko, a Boston University computer science professor, about the reality of artificial intelligence programming as a part of Harvard University’s “Science by the Pint” program. The series is put on by “Science in the News,” a Harvard student organization. “[Our objective] is to further science communication and bring science to the general public in ways that are accessible,” said Christopher Rota, co-director of Science by the Pint. Broadly speaking, Saenko said, artificial intelligence differs from other kinds of software because it makes decisions by gradually learning how best to make them. “[AI] can make decisions by learning how to make decisions from data, whereas regular computer programs are designed by people who write them and they have basically rules that those programmers write down and the machine has to follow to make decisions,” Saenko said. She spoke about different applications of AI, ranging from things people use in our everyday lives, like Alexa and Siri, to new upcoming technologies, like self-driving cars. AI is often misrepresented in science fiction and the media and often focused on the wrong issues, Saenko said. “I’m not worried about AI taking over. I’m much more worried about people or corporations using AI for profit in ways that’s not ethical,” Saenko said. She said media coverage in general struck her as quite negative with respect to AI research and that she wished that were different. Saenko told audience members that it was important to question new inventions and cautioned people against being afraid of AI for the wrong reasons. Saenko also spoke about the importance of AI technologies in our lives, and how they were not only being used to automate tasks that are tedious for humans to carry out, but had potential to partake in creative work, like making art or music. After her presentation concluded, Saenko and her team of students from BU’s Artificial Intelligence Research Initiative spread out across the room, each of them leading a conversation on the topic with a smaller group of attendees. The discussion portion, Rota said, is one of the most important aspects of Science by the Pint. “What I think makes Science by the Pint special and unique is the idea that we’re trying to take science into a more accessible place and we’re also creating opportunities for people to talk to scientists one on one,” Rota said. Christopher Wisdo, 49, said he attended the event to learn about new developments with AI. Furthering the accessibility of scientific information that doesn’t always reach the general public, Saenko said, made the cozy evening a success.